Doesn't that look so yum!! 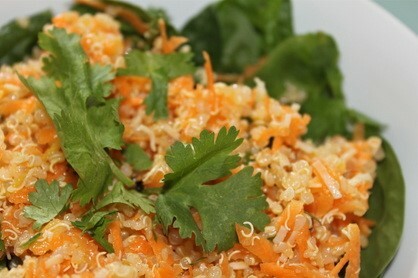 QUINOA AND CARROT SALAD - just the sound of that sounds amazing. I can't wait to try it! That is def going to be on my dinner list for the upcoming week! But there's so much more to healthy nutrition than meets the eye – proper nutrition comes down to the right serving size, eating foods naturally rich in fiber, vitamins and minerals, the right amount of protein and keeping your sugar and sodium in-take in check. In honor of March's National Nutrition Month, arm yourself with the right knowledge and recipes for life (not just the month). Something I am learning along the way as well! QUINOA AND CARROT SALAD (above) created by Executive Chef at Pritikin Longevity Center + Spa, Anthony Stewart. SWEET POTATO & APPLE SALAD - Simple and refreshing!